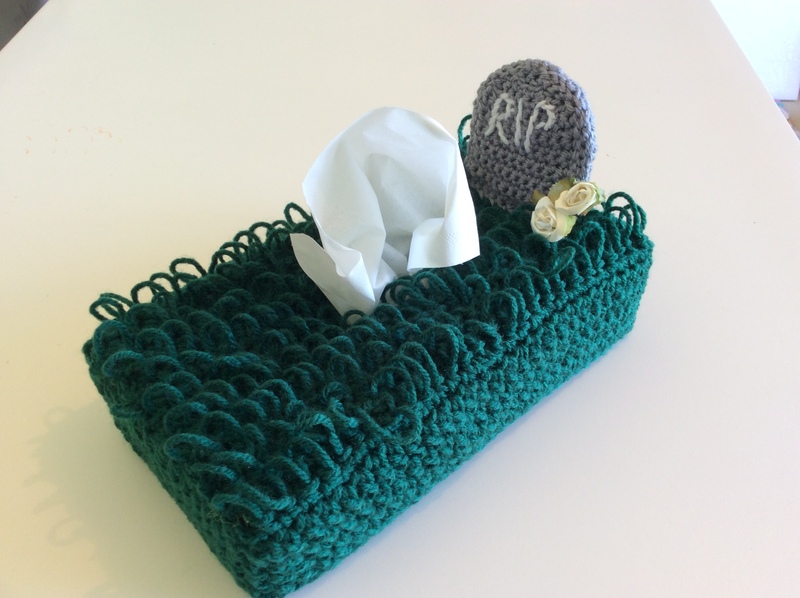 This is the Rest in Peace tissue box cover by thecrochetgirl. Her pattern is available for free on ravelry. This was my first attempt at the Loop crochet stitch and it was a bit trickier than expected, because I had to change the way I hold my fingers during a stitch. As suggested, I looked at Planet June’s tutorial which was excellent. I got the hang of it by the end and I liked how it turned out. I blocked the loops using colouring pens to hold them open while they dried – resulting in nice, standy-uppy grass. I deviated from the pattern a little bit (can’t help myself). Instead of fastening off and re-joining to make the hole for the tissues to come out, I just chained for the length I wanted the hole and then kept stitching. Why fasten off if you don’t have to? The headstone went together exactly as the pattern described, and I found some roses in my box of ribbons that I use for gift wrapping. Some would call it macabre but I’m really pleased with this spooky tissue box cover. This entry was posted on 18/10/2015 by flicstar in Homeware and tagged crochet, ghost, RIP, tissue box cover.